In the past, emotional support animals have typically been a variety of dogs. With the title Man’s Best Friend, it makes sense that dogs would be up for the job. However, horses form the same unbreakable bond with humans which can be very therapeutic making equine-assisted therapy possible and effective. The powerful connection between horses and humans is remarkable because it involves trust, unconditional love, and respect. 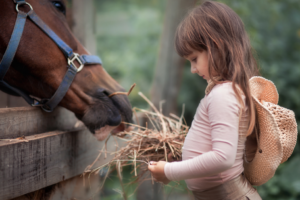 The book, The Clinical Practice of Equine-Assisted Therapy, connects the dots between multiple theories, extensive research, and practical methods for positive impacts on individuals who need therapy including physical and speech. For professionals who want to learn more about the best practices for equine-assisted therapy, this book is an excellent resource because it breaks down the terminology for a better understanding and provides recommendations for the implementation of these methods. At Ark Agency, we are known for providing quality horse insurance, but we also believe in creating new, long-lasting relationships with majestic animals like horses, which is why we support the author Leif Hallberg and the quest to enrich other’s lives by bonding with horses during therapy. To apply these unique methods to equine-assisted therapy, you can purchase The Clinical Practice of Equine-Assisted Therapy right now!